I woke up after sensing a heavy turbulence happened seconds ago, it happened again, I could feel the blood inside my arteries streaming faster. My heart pounds faster and I took a deep breath. I was listening to Andrea Bocceli’s heavy voice singing “Vivere”, a music album I found earlier in the airplane TV. It seems that I was listening to his album with my Bose headphones before I fell asleep. Inside the cabin was dark, most people are sleeping and covered by a blanket but I could see lights from several seats in front of me. 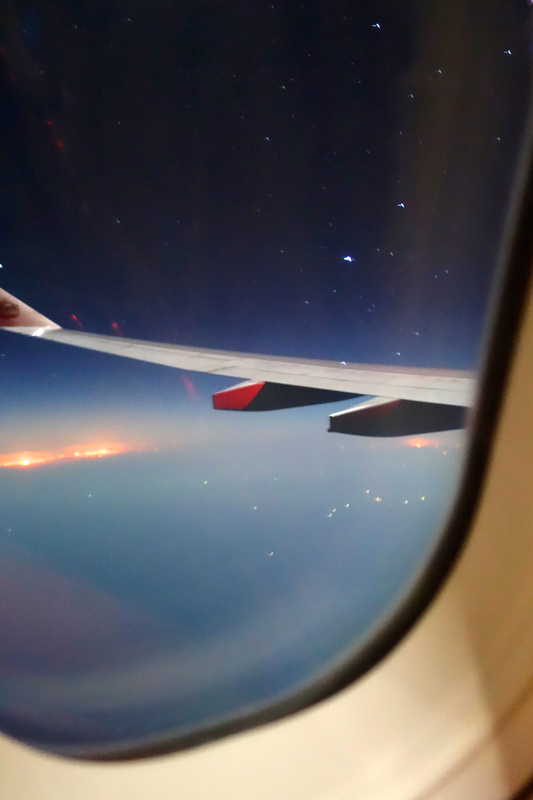 It was a dark outside, I saw stars shining brightly and a small light blipping at the end of the airplane’s wing. On the horizon I could saw a city with all its lights, I don’t know what city it is or where I was but I know where I’m heading. I was on my way to New York. As I wrote this, I am listening to the same album I listened to twenty five months ago. “Vivere” by Andrea Bocceli has been my daily music for commuting every morning and before night’s sleep since I got back home from America. On my way back to Indonesia from New York, I have a transit in Turkey’s Attaturk Airport for eight hours. Attaturk Airport is not very large, at the end of the terminal there’s Starbucks Coffee and a bookstores in front of it, which also sell music albums and electronics. I went to the bookstores when I see Andrea Bocceli’s head cropped in front of an album titled “Vivere”, I bought it in a heartbeat. Today, every time I listened to Vivere’s album I remember the time I was listening to it in on my way to and back from New York. It snapped in my mind like a reflex. There are many other songs that triggers me to remember events in the past, like listening to Alicia Key “Empire States of Mind” when I was passing the Empire States Building itself in a bus, Katherine Jenkins “I Believe” when I was passing snowcapped mountains in Middle East, and Mayumi Itsuwa “Kokoro No Tomo” when I was in Mount Fuji. are perhaps the most valuable assets I have in my life. I wouldn’t trade any of my travel memories with money, but I’m sure gonna trade my money for more adventures. For many people travel is a luxury, it is to me as well, but it is an affordable and worthy luxury. Beautiful memories are the enjoyment I had and cherish when I’m sad and burdened, the hope of going to the next unvisited place keeps me going. Traveling is one from many options to create beautiful memories, traveling with family and friends makes the memories even better. Do you remember the last time you are enjoying yourself? What are you doing and with whom? Would you like to do it again? Do you feel the elevated mood when you are cherishing the memory? That is the power of a good memories, an experience we could access to in our minds whenever we want to and need to. Another important thing is having an anchor to remember the memories itself, so it become accessible in the future. There are two media commonly used to create this anchor, visual and auditorial, photos and music. Both of these media are effective, but one of them is usually more effective than the other depending on a person learning style. Some people prefer photos over music, the reverse is also true, and both of them are equal. I use both photos and musics, when I have time to watch a slideshow of my journey I usually listen to the music as well. I don’t know if other people are enjoying these activities, but I do! This entry was posted in Review and Ideas and tagged anchor, beautiful memories, cherish, journey, memories, music, nostalgia, Photos, remember, Travel. Bookmark the permalink.